Ironwood is a timber tree found across the Malesian region of Southeast Asia. It is a member of the Lauraceae family – a group of tropical aromatic plants that includes the avocado, bay laurel and cinnamon tree. The tree is slow growing but, if protected, can reach a height of up to 50m, by which point it may have lived to over 1,000 years. Mature trees produce large fruits that, although poisonous to humans, are an important food source for foraging animals. 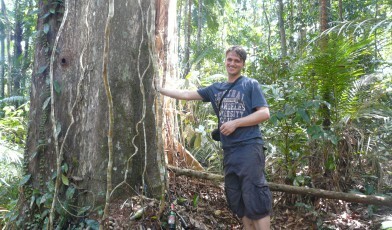 The Bornean ironwood has some of the hardest and most durable timbers in the world. It is also resistant to infection from bacteria and fungi and retains a lemon odour post-manufacture, making it an extremely popular tree among timber exporters. Logging, combined with the tree’s slow regeneration rate, has led to over-exploitation of the species with declines first recorded in the 1950s. Although the Indonesia government and the Sarawak state government have banned export of the species, illegal logging continues today. The species is also valued for cultural reasons. Dayak people, from Borneo, believe the tree protects them from dangerous animals and that its existence alone explains why there are no tigers or elephants on Borneo. In many villages, customary law exists to control exploitation of this sacred species. Local values and customary law may yet help to protect this majestic tree. In Ketapang, Fauna & Flora International is helping communities gain management rights for their forests. With additional support from the Global Trees Campaign, these same communities are learning how to grow and plant threatened species including the Bornean ironwood. FFI are also working with members of the Indonesian Forum for Threatened Trees (a group of tree conservation experts from across Indonesia) to develop a National Species Conservation Action plan for the species. This plan will help to guide local conservation efforts for the species across its range in Indonesia.